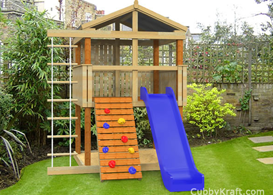 There are so many reasons why a Cubby Fort is the best type of outdoor toy for kids. I’m sure you can think back to your childhood and remember building forts and having the time of your life. The hours would fly by and by the time your mom called you in, you had played the day away. You went in tired, hungry and ALIVE! Full of fresh air and memories of your great adventures. Your smile put a smile on your parent’s face and all was really well with the world when looking through your eyes. Cubby forts are a place to be ‘me’. There is no reason to stand up straight or worry about the mud on your shoes. Your kids get to just be themselves without the responsibility of pretty much anything. Who wouldn’t love that? Cubby forts give kids the ability to jump start their creative play. They will think of many different adventures to play using their cubby fort as the main structure. For instance, it will be the pirate ship and your son will be the captain. Or, it could be the castle with a moat around it and your daughter can be the princess. While we could think of a few good ideas for the kids to use – and you can offer something like that up if they are struggling at first – but they will take these fun adventures to new levels. When you have adventures, it is hard to have them totally by yourself. Therefore, siblings will play well together in an outdoor toy like a cubby fort. Needing each other to make their creative worlds work will keep them from fighting or other forms of sibling rivalry. It will bring them closer together. And all kids can benefit from being closer to their brothers or sisters. And last, but not least, there is the amount of fresh air and exercise children get when they have someplace cool to go like their own fort. Less sitting in front of the television and more running around and playing is good for the development of all kids.